Peterhead’s seven-game winning streak ended in the rain at Hampden thanks to a freak Ciaran Summers double. The Queen’s Park full-back scored either side of half-time and Jim McInally’s men, despite a second half onslaught, were unable to salvage the situation and relinquished their position as League 2 leaders. The Blue Toon arrived at Hampden having gone top of the table the previous week and started as if they were determined to stay there. Jack Leitch was prominent early on, seeing one effort from the edge of the box drift over and then having another blocked by James Grant after being teed up by Scott Brown. But Queen’s Park’s high press wasn’t allowing Peterhead time to settle and the visitors almost conceded on 11 minutes. 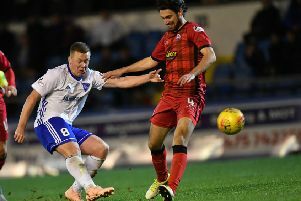 Jason Brown was caught in possession as the Peterhead defenders dithered on the edge of their own box and when the ball fell to Scott McLean his fierce strike was tipped over at full stretch by Greg Fleming. But while the Peterhead keeper did well on that occasion, he looked at fault when Queen’s opened the scoring in the 26th minute. Summers flighted in a free-kick which Fleming appeared to misjudge and allow to bounce into the net. It could have got worse for Peterhead. Kiaran Moore got on the edge of another Summers free-kick and headed across the face of goal, but found no takers. And Moore then fired inches wide after a terrific run down the left by Euan East carved open the Peterhead defence. Peterhead tried to respond and Rory McAllister was just too high with a spectacular overhead kick. Home keeper Jordan Hart then did well to push aside a Derek Lyle header and another McAllister header from a Jamie Stevenson cross flashed just over. It remained 1-0 at the break, but five minutes after the restart the home side were two up. The former Stenhousemuir full-back was given time and space on the left to deliver a cross which floated, Daniel Candeaias-style, over Fleming into the far corner of the net. McInally’s side needed a quick response and almost got one back when Lyle had a header from a Willie Gibson cross tipped over the bar at full stretch by Hart. Scott Brown had a close-range effort blocked by Hart and then really should have scored after a one-two with Ryan Dow put him through, but he shot tamely straight at Hart. Fleming kept Peterhead in it with a terrific diving save from a powerful low McLean strike from 25 yards, but Queen’s remained resolute and held on despite having Dominic McLaren sent off for a second yellow card six minutes from time.